Hello guys, I am here again with another Airtel cheap data trick that gives you a whopping 4.6GB data for N200 or 23GB for N1,000. Interesting right? Ofcourse it is. 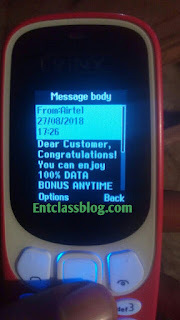 Just after posting how to get free 1GB data on Airtel, we are here with another cheap data trick on Airtel. This is exactly what you stand to gain here on EntclassBlog.Com. Without wasting much of your time, let's get straight to the topic. Please leave your comment below if it worked for you, and don't forget to share this post with your friends. What if I didn't get the message? Does it work on sims which have sent the SMS "GET" before? They just sent that my smartphone is not eligaeli for the plan and am using Nokia 3 android. Y?? I don't think it would work on that Sim. Kindly try another Airtel Sim. How do i change my imei pls? Message I got is with a condition. 500 naira data bundle and above before I can get d double data, should I still proceed? Dear Customer, Congratulations! You can enjoy 100% DATA BONUS ANYTIME EVERYDAY FOR THE NEXT 6 MONTHS when you buy data bundle of N500 and above. Dear Customer, Congratulations! You can enjoy 100% DATA BONUS ANYTIME EVERYDAY FOR THE NEXT 3 MONTHS when you buy data bundle of N500 and above. You are qualified. I have explained everything in the post. Please read and follow the instructions. I load d 200 naira card with 143 yet i was just given d 200mb not 4.6GB pls y? Dear Customer, Congratulations! You can enjoy 100% DATA BONUS ANYTIME EVERYDAY FOR THE NEXT 3 MONTHS when you buy data bundle of N500 and abovDear Customer, Congratulations! You can enjoy 100% DATA BONUS ANYTIME EVERYDAY FOR THE NEXT 3 MONTHS when you buy data bundle of N500 and above this is what I got said 500 and above does that mean I can't load 200naira? Your Balances are Data: 1000MB till 27-Oct.
YouTube Night Bonus: 1241MB till 05-Nov.
Night Bonus: 0MB till 25-Oct. Worked perfectly for me that's Mr Victor. Which phone model are u using??? Can new sim benefit this offer? I mistaken tried it like 3time... Now saying this offer is not available for me anymore..
You are not correct. Getting the congratulations message is just a step ahead that your smartphone is qualified for double data. Now, getting the awoof data, you don't need to load N500, just load N200 and follow the instructions in the post. If you weren't given the 4.6Gb data, then your sim is not eligible for the awoof data. What can I do t9 ksk3 my son eligible?? Just got mine. Tnx Victor. If you receive the congratulations message, then you are good to go. What is the time validity of the data? got mine , is it accumulative? Putting your Airtel SIM in sim1 may increase your Chances of being eligible. Somebody pls help me: how to increase download speed; it is painfully slow. The message I got is "couldn't fetch content, sorry" how can you help? What code were you trying? sir I did it and now it's has finished before the 30day can I try it again with them sim card? After using 10gb out of the Mb, I recharge another #400 and I was given again. @olayinka, do you get 10gb when you load N400 as opposed to loading N200? Is this still working plz? Mine is saying 'could not fetch content, sorry' i tried it on my redmi phone. Try using a Torchlight phone to send the text. Hello admin. I changed my imei but still it's saying my sim is not eligible for the offer anymore after mistakingly sending the message "get" to 141 twice. My sim is new and I hv been given double bonus for 3months. Sorry but I did and I hv been replied that the offer is no more available for me. Does this mistake and the response gotten mean that the double data offer has been cancelled too? I received the congratulations message but when I recharge with 200 airtime I got only 200 MB.WHY? It works pretty well on a model. Use your modem to send the message and you will receive the offer one time. I did mine and it's whooping like mad. What if it expires and I try recharging with *143*pin#,would I still be able get d 4gb data? Were you getting 4GB bonus before? I got the 4GB yesterday but when I recharge today they give me only 200MB WHAT IS HAPPENING? The message is not delivering any more, and even if it send they will reply you, not processed. will it work again after exhausting the first 4.6gb? I just get the SMS, what next? Follow the next steps in the post. Hello , good morning Victor.. I tired sending it with my smartphone, I was not eligible, then I slot the sim into my Nokia touch.. and I was eligible..now my question is..should I recharge and subscribe using my Nokia phone or my smartphone...and I have a current running subscription, hope it wouldn't have effect. You can recharge using your Android phone. Yes, it won't have any effect. Hello sir,when i sent the sms i didn't get a congratulations message. Will it still work? Please I tired using my smart phone but it didn't work so I tried a small phone and it worked I did the subscription and I was given the data but the next day I couldn't browse with it on my smart phone after exhausting 1gb from it, what do you think is the problem??? I have used the code 2times it worked I was given 4gb to day my mb is finished I tried it agian the gave me 200mb, is the code no more working? Helo...Airtel didn't wipe my data,and I want to top up d data. Is it going to work ?